The Textile Museum is basically what its name suggests – a collection of thousands of different kinds of textile from all the corners of Indonesia. 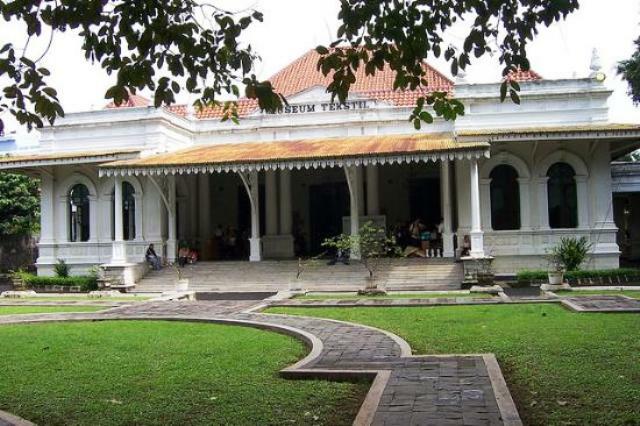 The museum, also called Museum Tekstil, is housed in a building along Jl Aipda KS Tubun. The building was built by a French man in the 1800s to be his private residence. Later on, it was bought by Turkish consul Abdul Azis who chose to live in Indonesia. The building was eventually bought by the Indonesian Department of Social Affairs in 1952. The building was then restored and was given to the regional government in 1975 to be used for the museum. The building of the Textile Museum itself is decorated artistically. Its lavish display rooms showcase not only the museum’s own collections but also those of the textile lovers’ society. In the museum, you will find all sorts of traditional textile. Each textile signifies a piece of cultural information about the place from where it was taken. Among the traditional textiles you will find in display in the museum are ikat, batik, pelangi, prada, tenun, songket, and Celup. An example of a traditional textile is the kain. The kain is worn not just to cover the body but also to identify one’s family relations. It also indicates one’s social status or position in the community. Therefore, by looking at certain kinds of kain, one will be able to identify or confirm relations even with distant relatives. Different kinds of kain collections in the Textile Museum are classified into three groups. These are the kain batik, the kain tenun or woven cloth, and the mixed collection. Aside from textile, the museum also keeps traditional equipment used in textile production, such as instruments for weaving and making batik. The museum also offers tutorials on how to make batik. If you want to learn how to make batik, all you have to do is pay for the museum ticket and buy a small batik about the size of a handkerchief. You can then proceed to the Batik Workshop building, which is a Betawi house located at the left of the museum. A tutor will guide you throughout the entire process of batik making, from sketching the pattern to mencanting (designing the actual batik) to doing the finishing touches. Mencancting a small batik may take 1 or 2 hours using a simple design and possibly longer for the more complex designs. If you want to keep making batik on your own, you can buy an entire batik-making kit for a reasonable price. The Textile Museum is open every day from 9 am to 3 pm except on Mondays and public holidays. The Batik Workshop classes are available every day from 10 am to 3 pm and are also unavailable on Mondays and public holidays. Students up to college level get a discount in the admission fee. Likewise, groups of 20 people and more are given discounts. The museum is near Tanah Abang market. You can get there by taking a taxi or a bajaj.